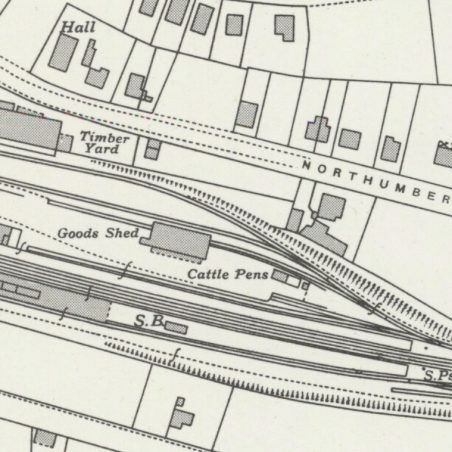 You are here: HomenextServicesnextPublic TransportnextRailwaysnextLaindon Station and Goods Yard. Laindon Station and Goods Yard. In the time of Steam Trains. 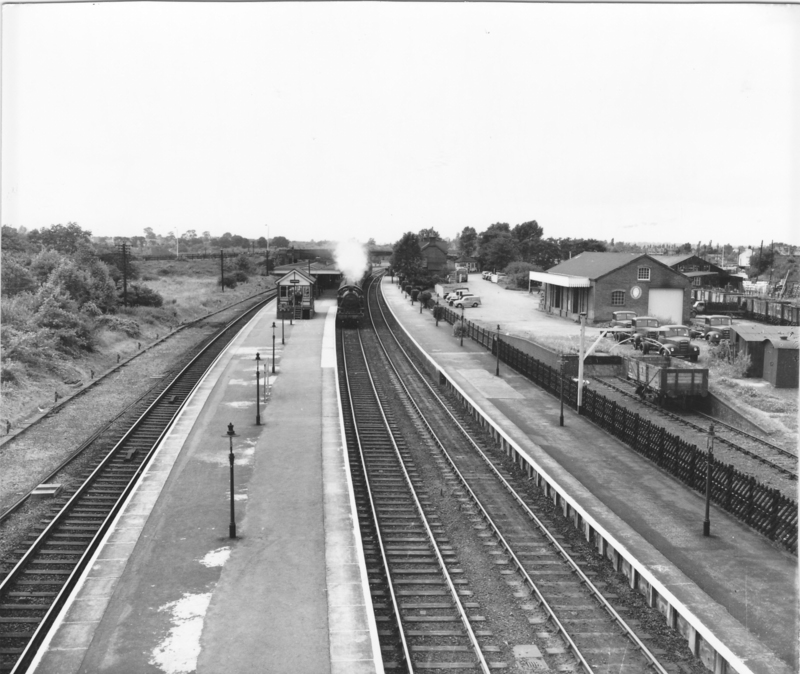 A photograph of Laindon Station taken from an interesting angle. Facing west towards the railway bridge, with the goods loading bay to the right. Steam train puffing its way through the station between the platforms. A bus/coach waiting outside the ticket office. Some interesting parked vehicles and at least four identical lorries in the goods yard. Some questions come to mind. What was he standing on? What year was it taken? The answers would be most welcome, in addition to any other available information. Note: Click on photograph to enlarge the image. Am I right in thinking the timber yard is Churchill Johnson? Editor:- Yes, you are correct. My brother, Colin Elliott, was a porter on the station in the 1950’s. He left to join the RAF. Does anyone remember him? Thank you to all contributors about Laindon Station. This was the first place I started train-spotting and have since stood on the footplate of a now Ex-Tilbury based loco, when it visited the Mid Norfolk Railway and not too far from where I now live. I have even gone so far as to own two models of the 2-6-4 and had my photo taken when I stood on the footplate as I said above. I am Founder and Chairman of a Model Railway Club that I started just over 12 years ago. My brother saw this photo and wondered whether there had been another footbridge at one time, where the photographer could have been standing. Does anybody remember? The Morris traveller that’s parked was introduced in 1952 which dates the picture probably mid fifties. Nina, I’ve blown the picture up now and can clearly see the Morris Minor Traveller, certainly this must be a mid fifties photograph, taking the Fordson Thames lorries into account as well. The bus outside the station is a Bristol single decker, owned by Eastern National and probably timed to wait for the train. It would have probably been on the Laindon Circular route, similar to the journeys we made to school, me at Laindon Park and you at Markhams Chase. As far as I can remember my Mum bought our coal from the Co-op lorries following on from my Nan’s tradition in Barking. Well done Richard for identifying the bus. I loved the Eastern National buses. I enjoyed those bus rides to school in the mornings (I think the fare was 2d). Starting at Sizer’s and finishing by whizzing down Church Hill to the bus stop at the bottom. We sometimes went on Eastern Nation coach’s day trip excursions to Kent. These started from the forecourt of The Laindon Hotel and the coach drove onto the ferry to cross the Thames before the Dartford tunnel was opened. I think the ferries were called the Minnie and the Tessa. I also remember going to Farnborough Air Show in the fifties on an Eastern National Coach from the Laindon Hotel. Now that was a long journey. Such memories!! Nina, looking at the OS Map 1947 you will see two dots at the right hand end of the station platform (east). These are marked SPs and are signal posts. These had ladders for regular maintenance of the signal arms and lamps by the signal crews. I believe the cameraman was given access to the ladders to take this wonderful photograph. Well done again Richard. Good observation, I’m sure you are bang on with your suggestion. So now it’s Richard “Hawkeye” Haines? I would just like to suggest that the coal lorry in this photo is a Bedford (model unknown) operated by Morris and Farmer. I say this because I’ve blown up the photo as much as I can before losing too much definition and then attacking it with a large magnifying glass. This in itself does not allow me to actually read the words but does show that the name is two words that look very much like Morris & Farmer. Any suggestions as to what the ovoid white spot surrounded by a paler coloured ring on the wall of the building is? Could it be or have been a company logo or advert ? Should have made this clearer, just to the left of the large white doors behind the new lorries. Nina I think the four lorry chassis in the yard are Fordson Thames types from about 1955-57. This would date the photograph from around that time. The train would have been hauled by a black 2-6-4 Standard tank engine from British Railways days, the carriages all slam door type compartment stock in maroon. 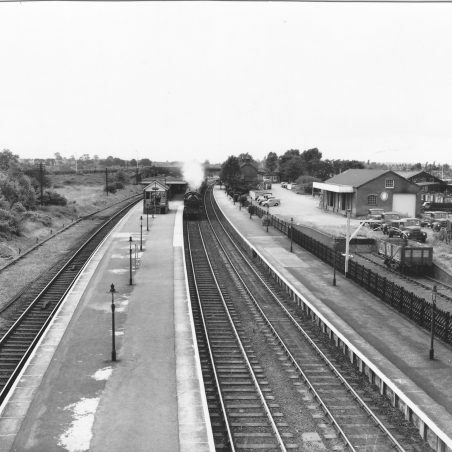 Remarkable the lack of people and cars around the station buildings and yards, bit different to the busy scene of today’s Laindon Station. Thanks for that Richard. The photo is easier to see now that the image has been enhanced. Still can’t make out the writing on the side of the coal lorry, although several companies had their depots at the station over the years including, Hayes Fuels, Morris & Farmer and A.H. Hall. Other coal merchants in Laindon were A.J. Gibbons of ‘Whitethorn’, High Road. Turners in Denbigh Road. J.C. Young, Coal & Coke. The Co-op and also Charringtons which was between the Laindon Hotel and Toomeys. The four identical lorries in the goods yard are all brand new vehicles. They would have been referred to as “chassis cabs” as they were as described just the cab and the chassis as can be seen in the picture. They would have been due to go off to the coachbuilders to have their bodies constructed and fitted. Probably to Laindon Body Works just over the bridge on the way to Langdon Hills or to Coles Body Builders along the A127 between Pound Lane and Church Road. It’s a shame I can’t enlarge the picture enough and maintain the clarity to be able to read the writing on the door of the coal lorry. An interesting photo. Steam Train at Laindon Station 7th March 2015.